Software companies tend to release regular updates which add just a few features yet still cost an arm and a leg. With most software, though, there comes a time when the code becomes bloated and messy, to the point where iterative updates are no longer efficient and it's better to start from scratch. Government laws and regulations are much the same, and it's pretty plain to see that in most countries they've become so bloated that we're long past the due date for a reset. How is this related to cities and architecture? When we consider the efforts of urbanists and planners to turn our cities around and reclaim them from the automobile's dominance, it's very relevant. A myriad of ballooning laws and regulations are making it all but impossible to build the fine-grained mixed-use city districts which are paramount for high quality urbanism and walkability. Regulations are making it more and more difficult for small developers who actually care to compete with large developers (you know, the guys who lobbied for added complexity in the system in the first place). It's quite ironic that the government is always talking about boosting the economy, but when it comes down to it, their involvement is, more than anything else, a hindrance. To build anything now, you need an army of consultants to get though the permitting process. You need environmental reports, sustainability reports, traffic studies, etc etc. And has this resulted in higher quality cities? No! On the contrary, it's resulting in the further erosion of neighborhoods, the destruction of historical properties, and increasingly oversized new buildings. The building process is becoming so complex and expensive that no small developer can afford it, which means more and more of all building is done by large developers, who in turn build grossly oversized buildings to recoup the expenses of the ridiculously over complex bureaucratic process. You see it throughout cities in North America: giant buildings encroaching on neighborhoods where they're entirely inappropriate, yet there's a complete lack of the kind of mid-rise buildings which would fit into and contribute to the existing context. Worse, the kind of historic neighborhoods most beloved by residents would be largely illegal to build today due to restrictive codes. 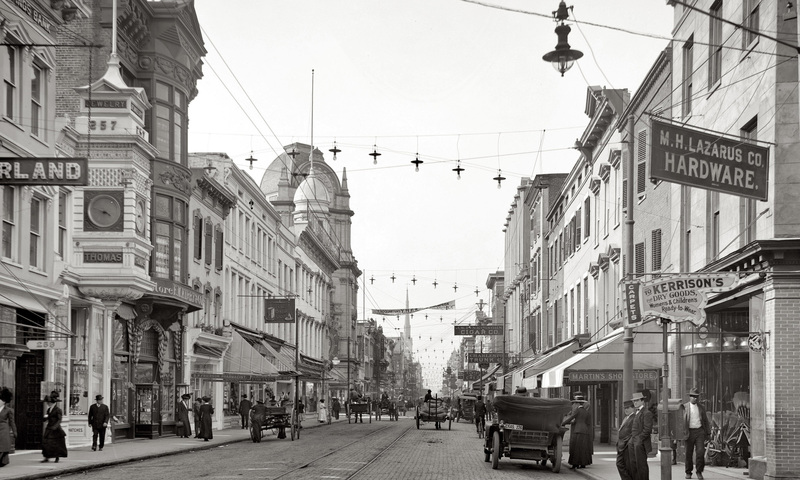 King Street, Charleston, around 1915. Beautiful and beloved, it would be all but impossible to build today, as it would not meet building codes. Among its illegal qualities are no setbacks, no parking, elements protruding over the sidewalk, apartments over shops, and street too narrow for fire departments' liking. With so many regulations restricting what you can't build, everything ends up looking the same while also being far more expensive. Cookie-cutter developments have become the norm, severely limiting choice. Whereas in the not too distant past our villages and towns grew organically, planned and built locally with knowledge that had been accumulated over thousands of years, today the most simple of tasks, even a new sidewalk, requires an expensive and extremely time-consuming process of permits, studies, and the involvement of dozens of consultants and government departments. The result is that the regular citizen is hardly involved, and the final product insanely expensive and vastly inferior in both logic and beauty to what laypeople once built. In fact, the most beloved neighborhoods of the 19th century were largely built with very little government involvement. Not only very little government, but very little so-called experts in general. In the 19th century, you didn't have specialists separated into architects, planners, builders, surveyors, and dozens of consultants. How do I know? One of the greatest resources available to anyone interested in London development is the archive of the Survey of London. It's an invaluable asset, with detailed information about the history of major developments such as the Grosvenor Estate, Ladbroke Estate, Portman Estate, and a host of other developments (called estates because they used to be, and some still are, private land owned by the landed gentry). Besides a huge amount of text, there are plans and sketches of the developments, and drawings of the buildings. What stands out reading the histories is that apart from needing permission to build sewers (likely because it was part of a larger system), developers were largely free to do as they pleased. Surveyors designed the street pattern along aesthetic desires, and architects and builders started work as soon as money was available. Often a surveyor was also an architect and/or a builder, or all three combined. None of them would be considered an "expert" by today's standards, as they rarely had formal training and the professions were not legally protected the way they are now. You were an architect because you designed buildings and called yourself one, not because you went through seven years of training and passed any sort of exam. And yet, the neighborhoods these non-experts designed were beautiful, superior to anything built since. Their work is proof of the power of common sense and talent. In fact, I would argue that it is precisely because of a lack of formal training that these men were as good as they were. Unencumbered by ingrained methods, they could follow their intuition. There was no one to tell them what was right or wrong, no "best practices" or government bureaucrats demanding that this or that code be adhered to. The simplicity of the process meant that anyone could be a developer, and in fact with the Ladbroke Estate (today known as Notting Hill), among the developers were carpenters, a doctor, a clergyman, and even a cheesemonger. The neighborhood they built is a marvel and the homes beautiful. Now they are among the most expensive in the world. 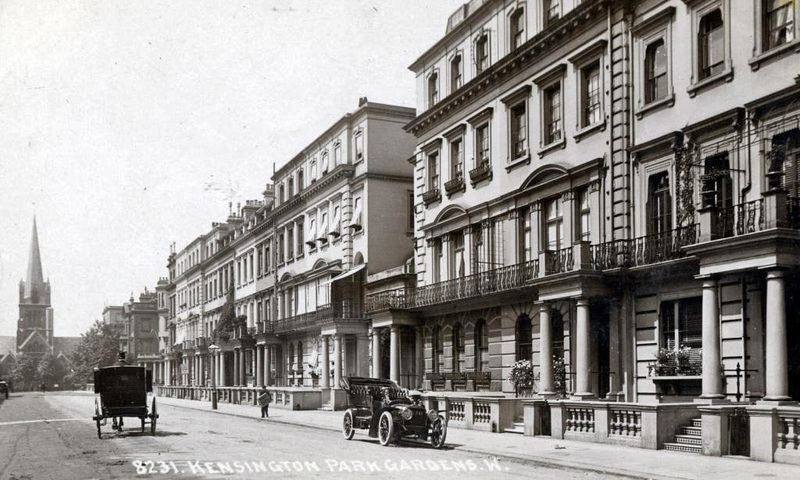 Kensington Park Gardens, Notting Hill, around 1900. Again, much of what makes this street special is no longer legal. Today, with laws dictating so much of what you can and can't build, suggesting that our housing development is "market-driven" is a complete sham. On the other hand, those 19th century developments we love so much were truly market driven. Developers built what they believed customers wanted, and everything was paid for by the developers, and in turn by customers. Unlike today, the streets, streetlights, sewers, and plumbing were not subsidized by the government. There were no tax abatements, no zoning telling them where they were allowed to build what, no minimum set back requirements, no parking requirements, and no standards of minimum or maximum units per acre. There was none of that. They simply built what they thought would sell, and the majority of the costs were covered by private investors, so neither were there banks demanding that the development conform to standard forms they could bundle into mortgage backed securities. This just barely scratches the surface. The simple fact is this: if we want our future towns and cities to be as beautiful and walkable as in the past, we must design neighborhoods that don't prioritize the automobile, and the government needs to get out of the way. We need to start trusting ourselves a little more. We know intuitively what's good and what isn't. You don't need a PhD to know a great neighborhood when you see it, and armies of consultants, big money, and government are all a hindrance to creating beautiful, local places. Especially the government and local and national codes, and the Department of Transportation, who are all only too happy to tell you what you can't do (for a fee, of course). I would highly recommend watching any of urbanist Andres Duany's speeches on lean urbanism for a dose of reality on these topics, what he calls "the hurdle of bureaucracy". Here's a good intro. Duany speaks with the kind of common sense sorely lacking these days, and he's also one of the greatest orators around. As one of the most prominent New Urbanist planners, he knows better than most the tremendous amount of effort required to get non-standard developments approved. City building is a task for generalists, for a jack of all trades, someone unbiased who can weigh everyone's needs equally, not letting any one group or entranced interest dictate the process. Beautiful developments require the triumph of common sense, something in short supply nowadays. And though it may be controversial to admit, and difficult to see happen, bureaucracy must be swept aside. Of course that's not an easy thing to do as governments never voluntarily relinquish their powers, but we are long overdue for a reset if we truly care about improving our built environment.